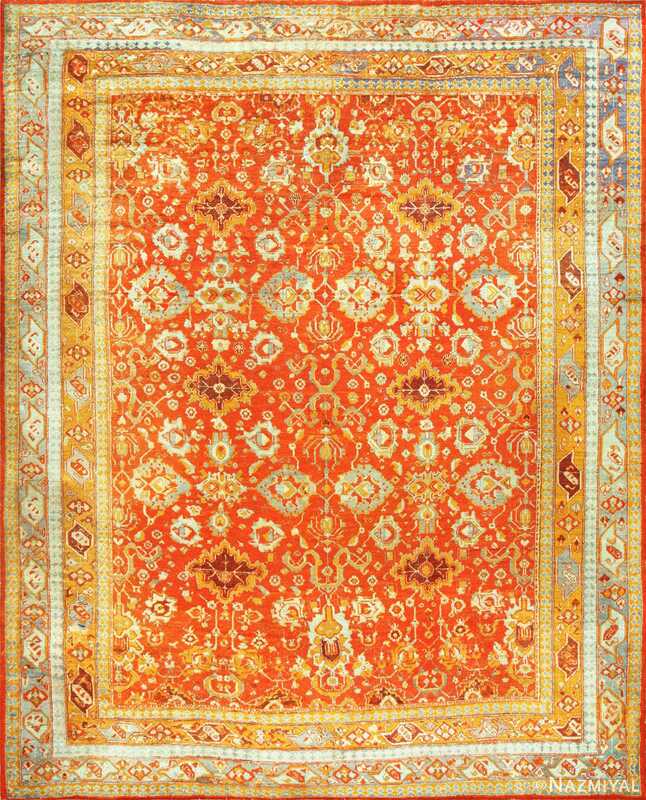 Luxurious and Breathtaking Large Size Antique Turkish Angora Oushak Rug, Country of Origin / Rug Type: Turkish Rug, Circa Date: Late 19th century – A fiery palette dominates the landscape, providing viewers with an exciting array of details that can help unify countless other elements in the room. 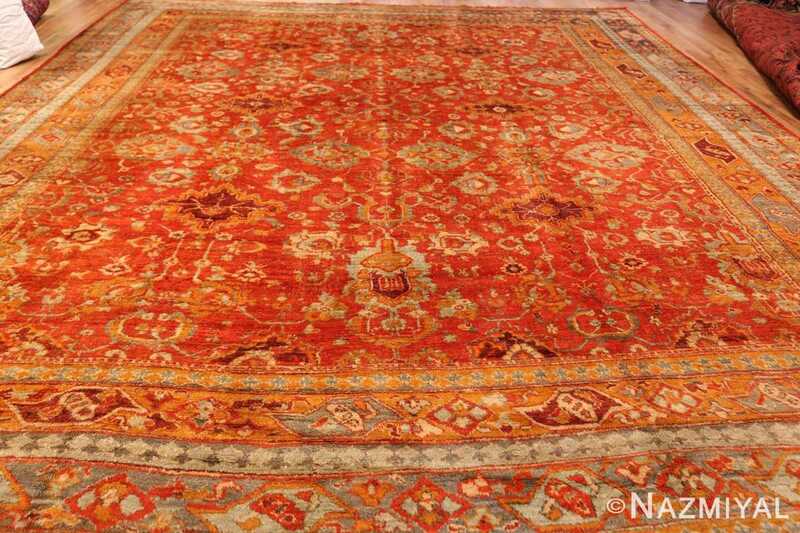 Like many other beautiful antique Angora Oushak rug, this attractive antique rug uses a number of symmetrical arrangements to establish the attractive presence of the floral elements within. 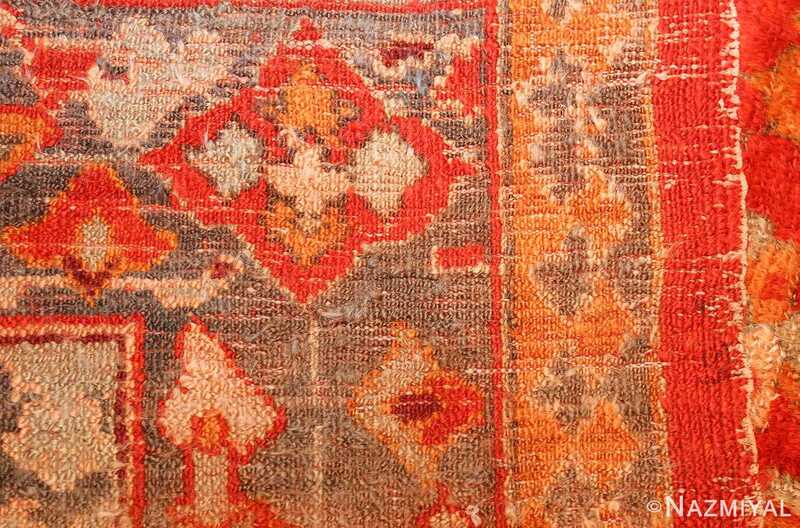 The darker vermilion tones stand out against the lighter caramel ones, both of which are further complemented by the presence of the light beige, the colors all combining to form a common theme without drawing attention away from any other section of the antique Turkish rug. 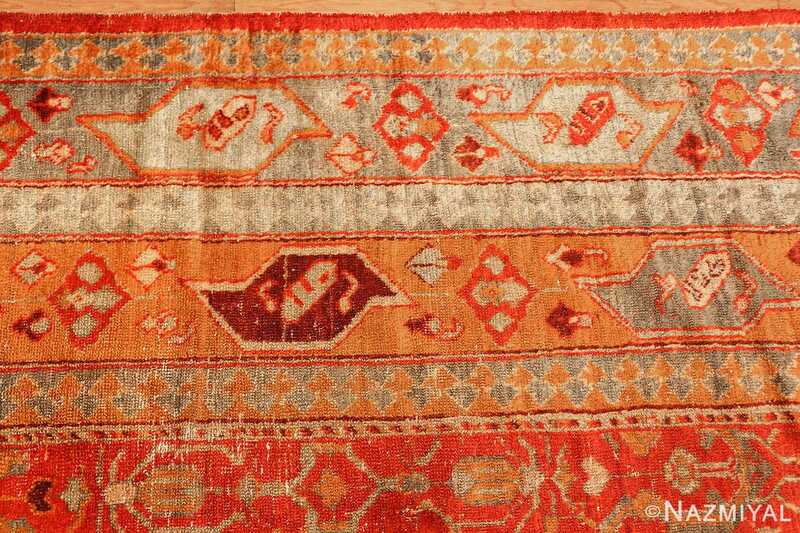 Several borders surround each other, leading the viewer’s eyes closer and closer to the core of the antique Oriental rug, where the majority of the activity stands out. Here, the floral elements are at their strongest contrast, simultaneously divided and united in their symmetrical arrangement on the surface. 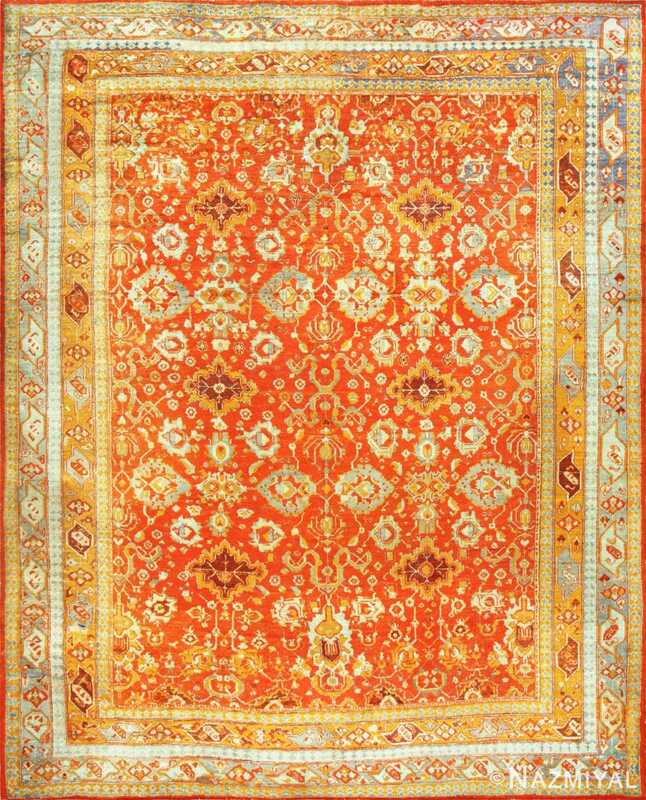 The large, angular floral design of his warm antique Turkish Oushak rug from the late 19th century reflects the opulence of the last days of the great Ottoman Empire. 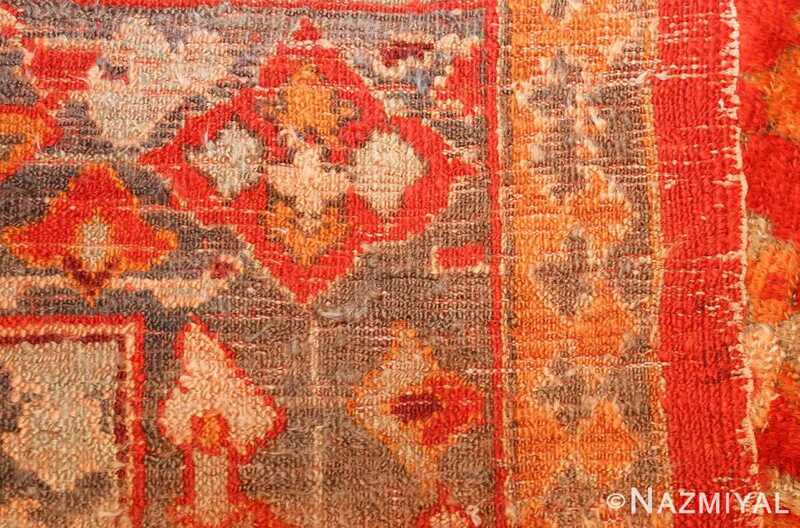 The richness of the jewel tone colors is reflected in the deep reds, glistening yellows that shimmer like gold, and the tranquil blues of the border. 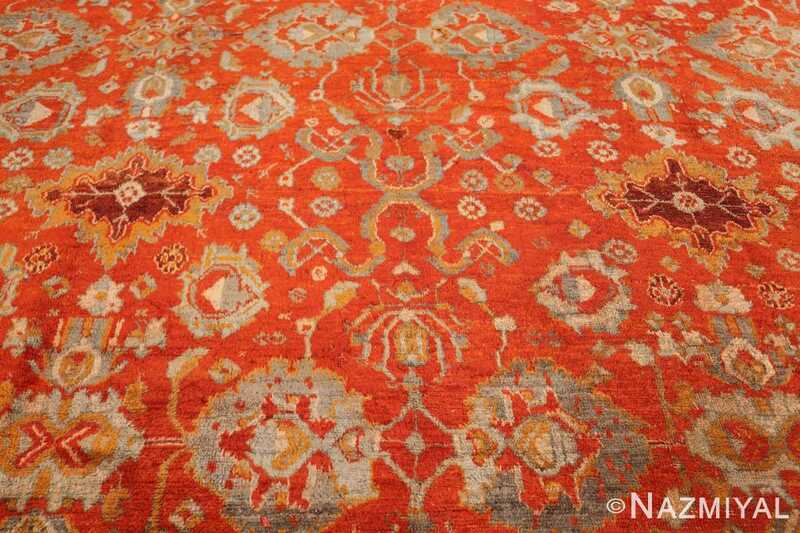 These magnificent happy rug colors and design elements come together to create a spectacular antique angora Oushak rug. 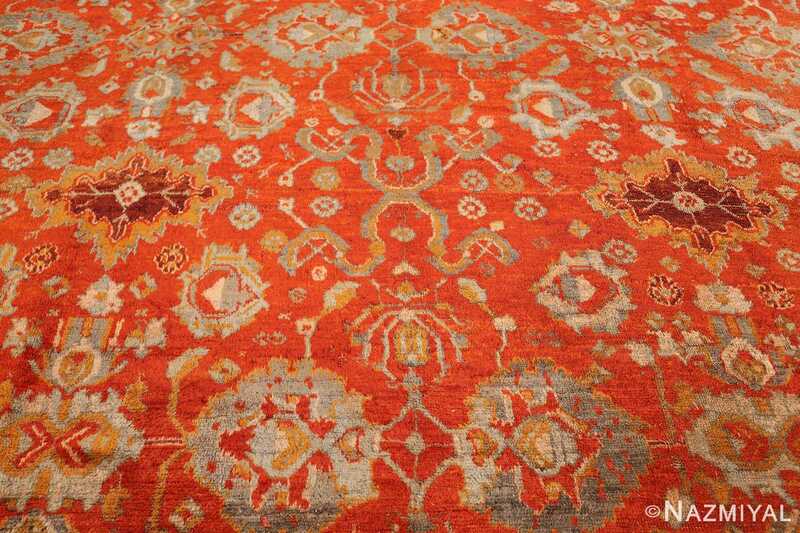 The large, angular floral designs are a distinguishing characteristic of antique Turkish Oushak carpets. 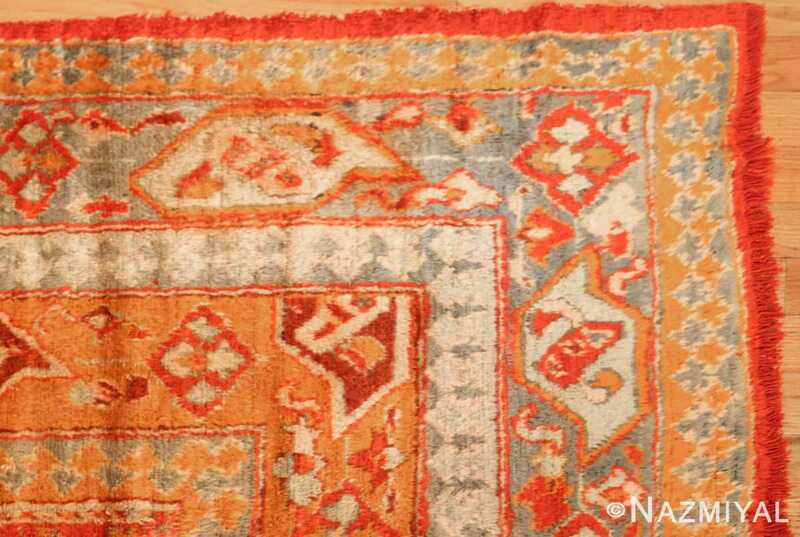 The symmetry of the antique rug adds a formal elegance that reflects the architecture of the great palaces of Ottoman Dynasty. If you look closely, you can see the larger geometric elements of the field, including pendants, vine scrolls and formal corners. However, these more traditional rug design elements are carried out subtly, rather than in a way that makes them apparent. Yet, they are still present in the design, only more subtle. 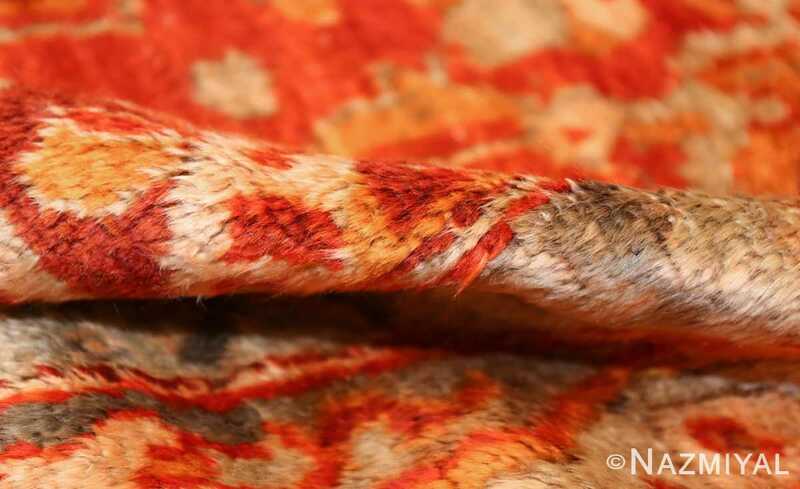 The masterful design of the antique Turkish rug, combined with brilliant colors, makes this antique Turkish angora Oushak rug a rare find and an excellent example of Ottoman art. 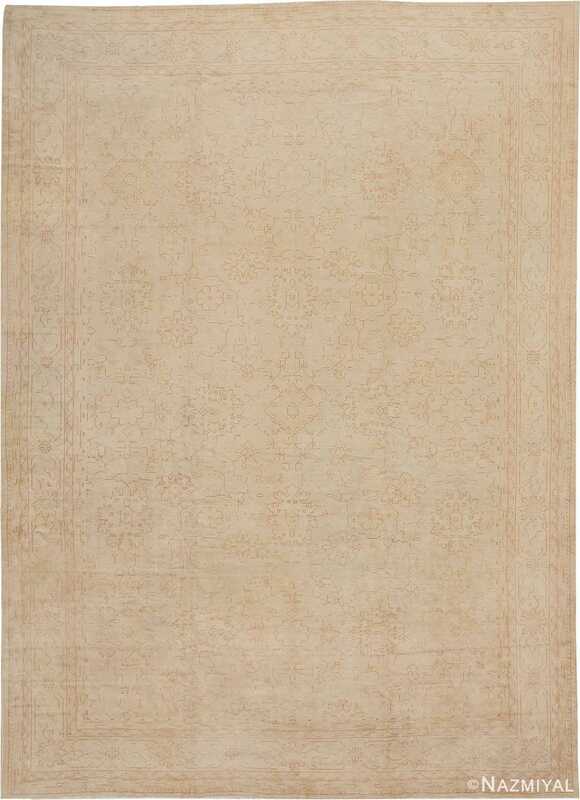 It is a large size rug that is truly fit for a palace and would make any space appear grand and spacious. 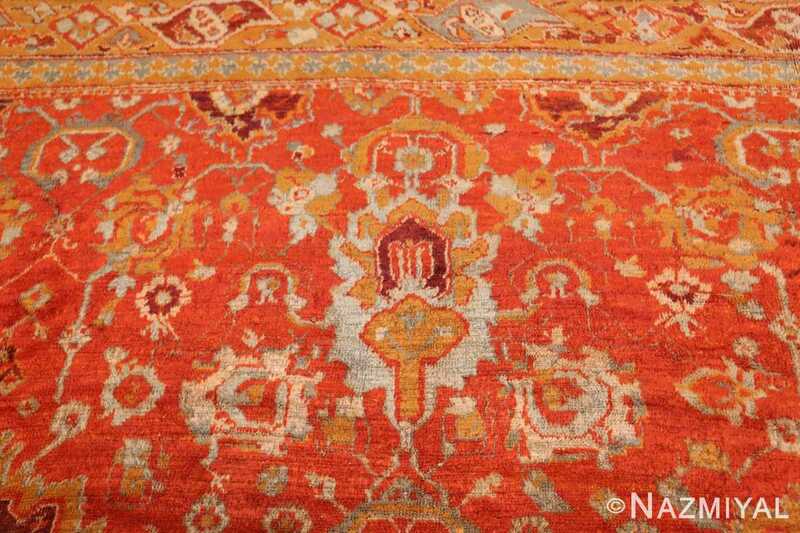 The characteristics that stand out most about this extremely luxurious carpet are its formal elements and vibrant colors. It would make an excellent addition to a collection of late 19th century antiques, or as part of any formal and even casual interior decor. 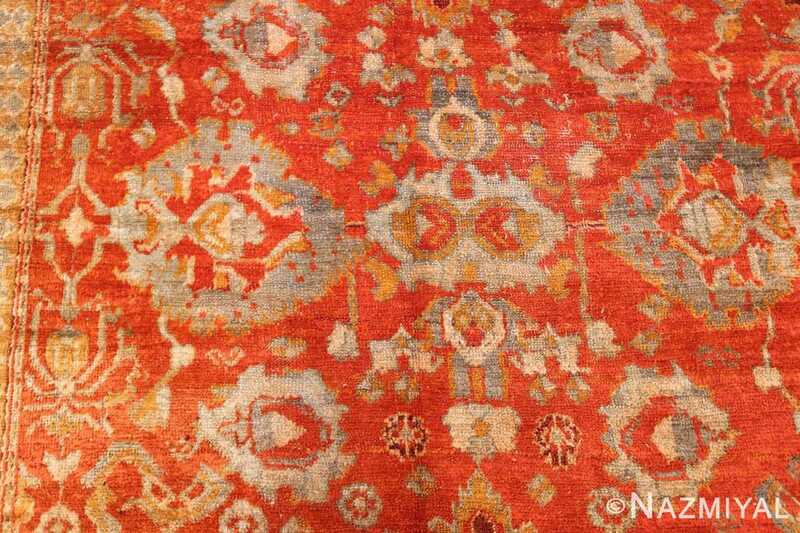 For those of us who love color, this Oushak rug has so much to offer. It’s soft silk like pile is a result of the unusually soft texture of the angora wool that was use when this antique carpet was woven. 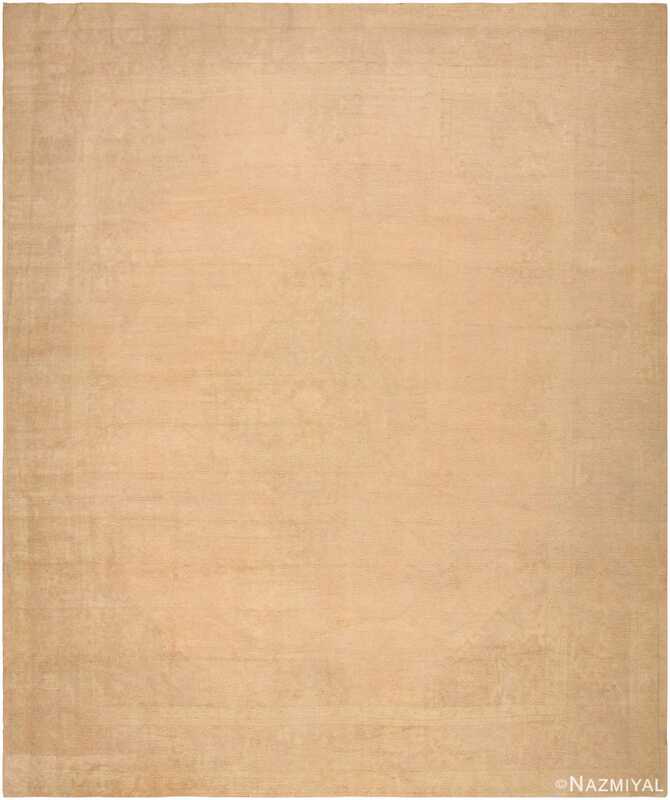 It is a breathtaking example that is as magnificent as it is rare. 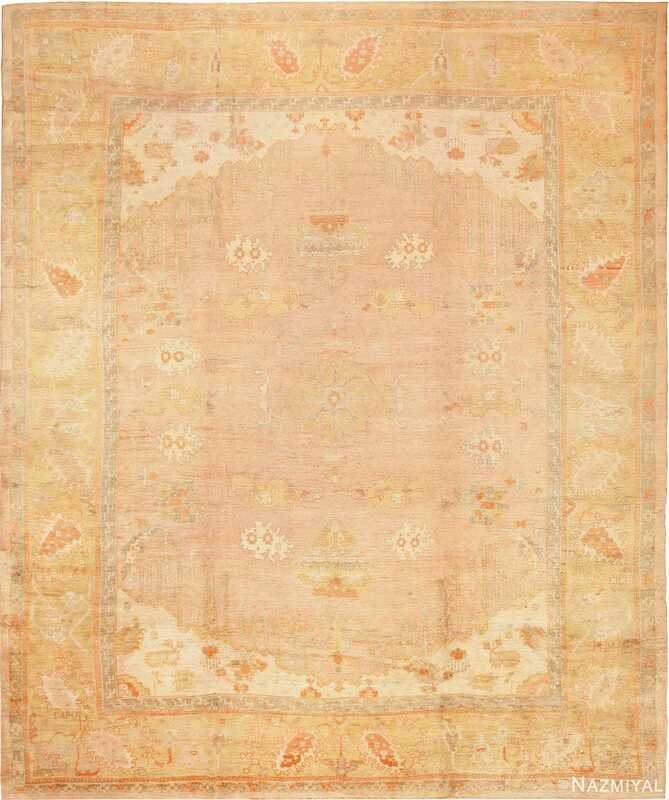 Woven in Turkey, this highly decorative Oushak carpet features a soft "ghost like" medallion and corner design spread over a palatial composition and executed in posh pastel colors.